The past decade has been a disaster for California, a state flattened under dismal growth and a $20 billion deficit that even Gov. Arnold Schwarzenegger cannot lift. But prominent Republican businesswomen and political newcomers Meg Whitman and Carly Fiorina are betting they can turn this train wreck around and lead the nation's most populous state — and the GOP nationwide — to a comeback. Former eBay CEO Whitman squares off against Attorney General and former Gov. Jerry Brown in the campaign to replace Gov. Schwarzenegger, while former Hewlett-Packard CEO Fiorina seeks to unseat longtime Sen. Barbara Boxer. 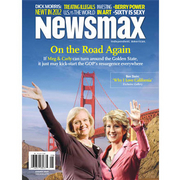 Newsmax magazine's exclusive report "On the Road Again" explores the two races — and what they mean for the country. For there is now far-reaching optimism that Whitman and Fiorina can set the nation's bellwether state back on the road to economic health and the GOP back to prominence. The ultimate outcome could well make a familiar statement more true than ever: "I have seen the future, and it's California." Breaking up California — the "three-state option"
Is California's real debt $1 trillion? Two Whitman and Fiorina qualities that make "GOP hearts flutter"
Mosque at ground zero called "insensitive"